The 46.82 metre tri-deck motor yacht Cherosa, listed for sale by Dean Young at HMY Yacht Sales, has been sold with John Weller and AJ MacDonald from Camper & Nicholsons International introducing the buyer. Built in aluminium by US yard Swiftships to a design by Tim Borland, Cherosa is ABS classed and was delivered in 1999. Accommodation is for eight guests in four cabins including a VIP suite on the main deck with panoramic views. Below lie a full-beam master suite and twin cabins to port and starboard, all with television screens and full en-suite bathroom facilities. The massive main saloon is aft of the separate dining area, with seating for eight to ten guests, while the starboard side has a bar with seating. There are silhouette blinds with eight large windows, giving this area fantastic natural light. The dining area has a large table with comfortable seating offering formal dining for up to 12 guests. The full-beam aft deck is air conditioned and can be completely enclosed and heated in poor weather. On the aft end of the deck is a raised dining area with a teak table that will seat eight on occasional chairs and six on the banquette. The skylounge is mahogany panelled and features three possible seating areas to enjoy movies on the 50-inch Panasonic television mounted on the forward bulkhead, while the DVD and music system are housed in a custom mahogany wall unit. Twin 1,081hp Caterpillar engines give her a cruising speed of 18 knots and a range of 3,000 nautical miles at 12 knots. 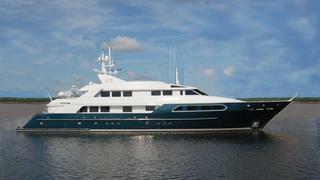 Lying in Palm Harbor Marina, Florida, Cherosa was asking $5,995,000.